THE Nigeria Inter-Bank Settlement System, NIBSS, has reaffirmed its commitment to supporting the nation’s educational system as the focus of its Corporate Social Responsibility, CSR, programme. Meanwhile, the company has supported twelve secondary schools in Lagos with office furniture for teaching staff as part of its CSR programme this year. 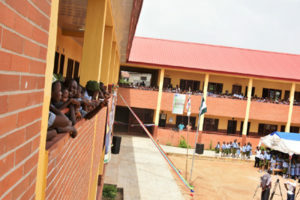 The programme was flagged off with the presentation of the office furniture to Eti-osa Community Junior Secondary School and Obadore Junior Secondary School, Lagos. Speaking during the presentation, Legal Counsel, NIBSS, Mr. Agboola Oladele said: “NIBBS is a shared service infrastructure for the financial system and as part of our CSR we reach out to schools as part of our support to the educational system and we provide Information Technology Communication, ICT, and technology tools both to aid their technological and educational development. We also provide them with furniture for the teaching and administrative staff. Today, what we are doing is to present furniture to this particular school and we are happy to be part of the educational development of the school.